NOTABLE CATCHES: 7 fish for S Blight, 7 for Peter Biscomb, 5 for Joe Halton, 6 for Bob Fitzpatrick and 6 for Bernard McBride. NOTABLE BAG: 2 fish weighing 5lb for S Blight. BEST RAINBOW: 6lbs for Bob Fitzpatrick. BANK ROD AV: 3.42 fish per angler. BOAT ROD AV: 1.71 fish per angler. Sport: There were a few anglers who did well today but it could do with being a bit warmer, March tomorrow, how time flies. First lets see how the bank anglers fared. Joe Halton fished in Hollins bay where he tempted 5 rainbows with a white nomad on an intermediate line being his best tactic. Both landing 7 fish from the bank were S Blight and Peter Biscomb. They found Bell point the best spot with black and green lures on floating lines. They said the trout were lying very close to the shore. Now for the boats, Bob Fitzpatrick and Bernard McBride both landed 6 fish with several weighing between 4 and 6lb. Bob caught his fish on cormorants on a fast glass line up in the northern shallows and found a fast retrieve best, unusual as a very slow retrieve has been best of late. Bernard McBride found willow isle his best spot and stuck to nymphs on a floating line with a uv muskin being the best, check them out in the shop, they do look fishy. Bernards best fish was a super looking 5lb rainbow. Syotw. This entry was posted in Stocks Reservoir Fishing Reports on February 29, 2016 by staff. This entry was posted in Stocks Reservoir Fishing Reports on February 28, 2016 by staff. Sport: It was great to see Laurie Taylor and the rainbow warriors on the water today. Five warriors fished from the boats to catch a total of 42 trout between them. This was a great catch as not everyone was finding it easy. Laurie said that it was important to cast at the shore and that most of his fish came right at the start of his retrieve. They found a Di3 the most successful line with a hothead tadpole on the point and cormorants on the droppers. Their retrieve was slow. Mark Kendal had one fish from the Northern Shallows then six in quick succession from the shore near the jetty. He lost a double figure fish at the net as well. Mark’s best pattern was a cat’s whisker. Ian Buckley and Neil Gregory both had 10 trout a piece to 3lbs whilst bank fishing in Hollins. They both used the same method: an intermediate line with a black n green lure. Andrew Overend also had a good half day with six fish to 3lbs from Bell Point and his catch included a tag fish that won him a £50 tackle voucher. He walked away with some new fishing luggage. This entry was posted in Stocks Reservoir Fishing Reports on February 27, 2016 by staff. This entry was posted in Stocks Reservoir Fishing Reports on February 26, 2016 by staff. NOTABLE CATCHES: Jim Hunter 10 fish-David Manning 8- Jim Baron 9- John Sykes 16.
NOTABLE BAG: 5 fish weighing 10lb for Jim Baron. BEST RAINBOW: 10lb for Mike Horton-13-15lb for Bob Fitzpatrick-12lb for John Sykes- 9lb 8oz for Jim Hunter. BEST BROWN: 8oz wild brownie for Steve Bland. BEST BLUE: Several weighing 2lb 8oz. BANK ROD AV: 5.60 fish per angler. BOAT ROD AV: 6.00 fish per angler. Sport: As well as some good catches there was a good stamp of fish caught with rainbows ranging from 4lb right up into double figures. Jim Baron had a good day landing 9 good rainbows. Jim bank fished around Bens beach where an olive cat on an intermediate line worked well. Mike Horton fished near the jetty with a white and green lure and tempted a fit 10lb rainbow that after a good fight powered off after being released. John Sykes took the top rod today with 16 quality rainbows with fish weighing 4lb, 6lb and a cracking 12lb rainbow. John fished in Hollins bay and at 2 trees to take his haul with damsel and a squiggly worm pattern fished on a ssi line almost static being his winning tactic. Out on a boat was David Manning who caught 8 fish from willow isle. Like other anglers a damsel was his best pattern. 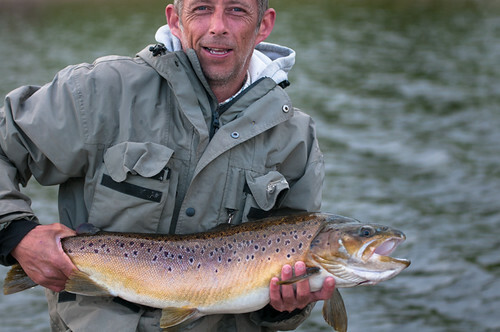 Jim Hunter caught 10 trout with his biggest weighing 9lb 8oz Most of Jims fish were caught in the northern shallows with a damsel once again being the top pattern. Bob Fitzpatrick was into the big fish with a giant rainbow estimated to weigh between 13-15lb. Bobs big trout was caught on an olive snake up in the northern shallows. A good day for big fish. Interestingly a lot of anglers said that they were fishing almost if not static flies and as you have just read olive was most defiantly the top colour. A good starting point for tomorrow. Syotw. This entry was posted in Stocks Reservoir Fishing Reports on February 25, 2016 by staff.